I can't believe it's been 4 months since Ciarán was born. I've been meaning to write about his birth for ages, but I'm only now getting the chance to do it. I guess I wanted to give it the time it deserves, because it was such a deep experience. But, as I've said before, writing the birth story of a child is so important-better late than never! The drama of Ciarán's birth began a week before his arrival, when the midwife found that he was lying transverse. Because this posed a risk of prolapsed cord if my water broke, I had to go into the hospital. I was broken hearted heading in there. It was a beautiful sunny bank holiday weekend, and we had made plans to spend that Sunday in the park. By the time I'd walked up to Holles St. he'd turned head down again, and thankfully he stayed that way for 24 hours and I was released. What I did get out of that stay in hospital was a bit of rest, something that had eluded me at home with the two other kids. That was the week of Daithí's election, so he was very busy and we were all preoccupied. On Friday, the day of the voting, I dropped Síofra off at school and had a chat with my principal. I remember telling him that this baby was waiting for the election to be over before arriving. I didn't realize then how precise this prediction would be! The polls closed that night at 10 o'clock. Daithí was with other campaigners at a friend's house. At 10:05 pm I felt a pop and realized that my water had broken. I really hadn't expected this because with the other two my water hadn't broken until minutes before their births. This was the first of Ciarán's surprises. I called Daithí to come home and I also rang the midwife to come and check the baby's position, even though I wasn't having any contractions yet. From the time I called the midwife out and when she arrived, I literally didn't move from the chair I was sitting on. I felt frozen there, afraid that he was transverse and if I stood up and had a gush of fluid, the cord would come down. This feeling of fear doesn't lend itself to labor getting started! The midwife, Kate, arrived at 11 o'clock and checked me. Ciarán was head down, but still a bit high and I wasn't dilated. This didn't really surprise me, but I was relieved that he was head down. Kate left and told me to call her back when things got going, which would probably be during the night. Daithí and I went to bed. When Paddy was born I'd been able to sleep during early labor, so I thought I'd do the same this time. I did sleep, but the contractions were slow to start and irregular. At 5 am I felt things were far enough along to call Kate back. I also called Dee, my friend and doula, to come over. They arrived about 20 minutes later and...things slowed down to a near halt. The contractions weren't very strong, and were irregular. I knew this myself, and I was feeling really discouraged. I'd thought the baby would have been born by early morning! Dee and I took a walk outside, but that didn't help, either. I also became really aware of being watched, and started to feel self-conscious; plus, I knew Síofra and Paddy would be waking up at 7 or so, and as that time approached, the contractions slowed down even more. I started to believe this baby was never going to be born. The kids woke up at 7:30 am, and Daithí quickly got them dressed. Arrangements had been made for our friend Keith to take care of them that day, and Dee drove them over there. Dee had sensed that I was feeling "watched" so she headed home after dropping the kids at Keith's, so that I could have a bit more privacy. At 8 am there was a shift change for the midwives; Kate went home and Niamh arrived. That's when everything changed. I'd met Niamh first 5 years ago the day that Síofra was born. She was the person who planted the idea of having a homebirth in my head. Although she wasn't present at Paddy's birth, she had been part of the team of midwives who provided my antenatel care. And when we lost Fionn she was at his memorial service. She'd joked with me earlier that week that she was on duty Saturday and if the baby was born then it'd complete the circle for us. I was really glad to see her that morning! As soon as Niamh arrived the whole atmosphere changed. She started by telling me I needed to get warmed up. She cranked up the heat and closed the windows. I remember her saying, "Ok, where are you going to have this baby? Over here by the radiator would be nice and warm." She set up a place for me to give birth. All of the sudden I felt like I was actually going to have this baby soon! Niamh called for the second midwife to come over, which also boosted my confidence that the baby was indeed ready to be born. Nicki arrived 15 minutes later. In the midst of Niamh getting the house ready for a birth, she came over to me as I sat on the birthing ball and said, "Just remember, you have your little Fionn watching over you through this." Something inside of me shifted, and I had a little cry. I was still holding on to the fear and grief that was deep inside me. Those few tears released that; this was a profound moment for me. I realized that even though I was desperate for my baby to be born, my own body and mind were holding him in. Once I let go of that last bit of fear, the contractions came on fast and furious. This happened at about 8:30 am. The apartment was roasting hot. Niamh got me into an even hotter shower. I returned to the corner of the room she'd set up. There were towels and plastic on the floor, and she'd set a chair for Daithi to sit in with the kids' little pink bathroom stool in front of it for me to squat on. I was beginning to feel a bit of an urge to push, but it was nothing like the overwhelming urge to push I'd had with Síofra and Paddy. I tried pushing a little, but it didn't seem to be going anywhere. I couldn't believe how different this birth was from the others! I thought I knew my body, but this was new territory. Niamh checked me at 9:10 am, I was three centimeters. I couldn't believe it was only that much, because I felt like the intensity was as full on as it could get. Niamh dragged me back into the shower, even though I was crying that I couldn't do it anymore. I threw up in the bathroom, which made Niamh very happy! I made an attempt at a few pushes in the shower, so we headed back to the corner. Daithí sat in the chair behind me and supported me under my arms, while I squatted down on the little stool. Niamh kept telling me that I'd have to squat deeply, which isn't a position I'd imagined using or felt inclined towards using. What she knew that I didn't know was that Ciarán was in an unusual position, occiput posterior. She was wise enough not to tell me this, and knew that a deep squat would help me push him out. At 9:25 am I was pushing with all my might. When I say all my might, I mean that I was using every single ounce of energy and power that I had. Every time he'd move down a bit, he'd slip back up at the end of the push. Niamh, Nicki and Daithí were all encouraging me to push harder and harder, and even though I felt I didn't have anymore to give, I did. Daithí told me to look at the clock, that our baby would be born by 9:30. It was 9: 26. That really encouraged me, and with one last monumental push, Ciarán's head was out. The rest of him came out with one more little push. It was 9:27 am. I have never, ever felt so relieved in my life. Niamh put him into my arms. When Niamh told me he'd been OP, or "sunny side up," all the stopping and starting of the labor made sense, as did all that ferocious pushing. 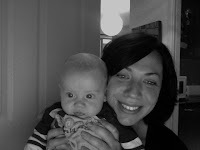 Not only that, but he was a nice big baby, too-8 lbs. 10 oz. (A whole pound bigger than Paddy had been.) I quickly delivered the placenta and then Ciarán and I moved to the couch and he immediately began feeding. The photo at the top of this post was taken about 10 minutes after he was born. He fed, and fed and fed all that day. Síofra and Paddy came home that afternoon and were thrilled to meet their new little brother. Daithí had a very disappointing election result, but the joy of our new baby helped us to get over that. Babies who are born face up, like Ciarán was, are called "Stargazers." I can't begin to thank Ciarán enough for all the joy and healing he has already brought into my life and into our family. After losing Fionn, I didn't think I'd feel hope and happiness the same way again, but thanks to my stargazer Ciarán, I am. My dear friend and doula, Dee, met Ciarán for the first time the following morning. Even though she wasn't there at the moment of his birth, she was a part of it. She wrote this poem for Ciarán's welcoming ceremony. the burden of worry that just wouldn't go away. what if everything will be okay? the only evidence the swelling of your Mama's belly. So precious, so private, so much. A beautiful story Bridget...I'm crying my eyes out. I'm so happy you shared it. I too have a "stargazer", my sweet Erin. She was born looking up and has remained that way for 26 years, Ciaran will also. my regards to you and your beautiful family.